Integrating Materials and Manufacturing Innovation is committed to building a seamless and dynamic materials and manufacturing design framework supporting the accelerated discovery, development, and application of materials and processes. The journal explores innovations from the discovery of materials through their manufacture that support the practice of Integrated Computational Materials Engineering (ICME). 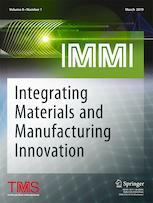 IMMI focuses on presenting new experimental and computational tools, data analysis and management methods, and valuable multiscale datasets, and on the impact the use of an ICME approach has on advancing materials and manufacturing technologies. As of January 1, 2017, IMMI will convert from an Open Access journal to a subscription journal. IMMI will continue to be published by Springer Nature. All new manuscripts should be submitted via the new editorial submission site www.editorialmanager.com/immj. IMMI is a publication of The Minerals, Metals & Materials Society (TMS).